Using Lithuania as an example, the Head of the EU Advisory Mission in Ukraine Kęstutis Lančinskas, talks about the mistakes Ukraine has made setting up the new police and how much time is needed to fully make a break with the past. Kęstutis Lančinskas, from Lithuania, arrived to assist Ukraine with the reform process in February 2016, after an open selection competition. In his native country, Mr. Lančinskas was actively involved in Lithuania’s reforms since the early 1990s, when Lithuania gained its independence and the authorities called for recruits to the newly established police. From that time, Mr. Lančinskas held various management positions in the Lithuanian Police for over twenty years. “We did not need to be told to work overtime. I remember times when we slept in our offices and went home after three days in the office only to take a cold shower, as, due to Russia’s embargo, there was no hot water. There was no heating oil, or anything else. But we were young. These were great times”, Kęstutis recalls of his early career. Today, Mr. Lančinskas and the Mission he heads are busy reforming the civilian security sector in Ukraine, i.e. the police, prosecution, judiciary. EUAM works together with the State Border Guard Service, supports newly established anti-corruption agencies, shares best EU practices on public order, community policing, Human Resources Management. European experts conduct trainings, coordinate the projects of other international donors, and provide strategic assistance to law-enforcement agencies and rule of law institutions. 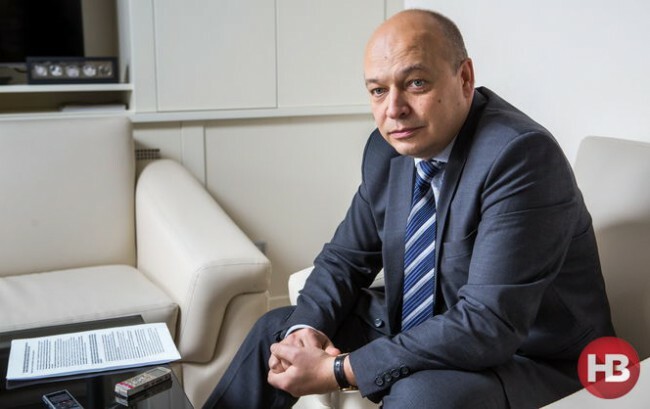 In an interview with NV, Mr. Lančinskas elaborates on the key mistakes made during the Ukrainian police re-attestation process; speaks about why corruption cannot be defeated overnight, and explains the importance of the right mentality in implementing reform. — Why did you decide to come to work in Ukraine, a country going through a crisis and war? — In the regional police, where I worked, we had fixed-term contracts and so I had to think about what I would do when my contract came to an end. At the time, I got invited by our Ministry of Internal Affairs to apply for my current position in Ukraine. I thought, why not? By nature, I’m the kind of person who wants to try out something new. There was a lot of sympathy with Ukraine’s revolution – I also supported what was happening. I thought — if I can, why not assist with the implementation of reforms in Ukraine. — Did you have any doubts about whether it was worth coming here? — There is always room for doubt. My family has stayed in Lithuania and there is no way to bring them here. Stepping out of the comfort zone that you have created for yourself is on the one hand always a positive challenge, and on the other puts you in some discomfort. There are plusses and minuses to this. When you are stepping out of your comfort zone, you are forced to take an interest in and learn something new. For me, this Mission is a new experience and new challenge. There are 24 countries represented in EUAM, which is very interesting. — As someone who has worked in the police for many years, what do you think of Ukraine’s police reform so far? — I’ll probably be unpopular, because I know the opinion of Ukrainians and Ukrainian opinion polls. However, the police has launched very deep reforms. The results of these reforms won’t be apparent overnight, and will only be visible after some time. That is why they are laying foundations for reforms to develop and progress in future. On the one hand, I think that reform has been positive so far. On the other, I know how difficult it is to reform a system so huge, with such a large number of staff and which is so underfunded. And on top of everything, there is the conflict in the East of Ukraine. All in all, the conditions for implementing reforms are complicated. Nevertheless, in two – three years’ time these efforts will pay off. — How is your cooperation with MoIA and the NPU? — We work very closely with both the National Police and MoIA. Our experts meet with law-enforcement officers, I often meet with NPU management, we conduct joint trainings, work on documents, on strategies for the NPU. The fact that, given the situation in the country and the pressure from politicians and society, the MoIA and NPU management took the responsibility for implementing the reforms is, alone, worth respect. — The old police (militsia) was notorious for having a very corrupt structure. Do you think re-attestation has helped get rid of corruption? — As I said earlier, results won’t come immediately. I am often asked whether re-attestation was necessary, and whether it went well or poorly. I think re-attestation was a necessary step. The way it was conducted is a different issue. Re-attesting 100,000 people in less than a year is a major achievement. Yes, there were mistakes made and not everything went perfectly, but it was necessary, for both society and the police. Police officers should understand where they work and why their work is important. — Which mistakes have you spotted? — I think that anything similar to re-attesting 100,000 staff in a single organisation has never been done before, anywhere. First, there was an issue with internal communications, as police officers were not given clear explanations why this re-attestation was required. At the beginning, not all processes were perfect. The re-attestation commissions did not have any previous experience in this area, so they learnt as they worked, making their own mistakes. But all can be explained by the lack of time for preparations. I can only imagine the amount of pressure these commissions were getting from society and politicians; everything had to be done very quickly. Mistakes are completely normal under such circumstances. — People say that former militsia offers are being reinstated to their jobs by courts, due to their connections. — I cannot comment on this, as I too only hear about this from the media. Yes, there were instances when those who failed re-attestation were reinstated. However, one must take a look at the relevant documents and see which arguments were used to determine why it happened. — You promote community policing. What is a police officer’s ideal behaviour in this regard? — Those police officers who pass re-attestation must be re-trained quickly, because the philosophy of the police is changing. In Soviet times, police officers did not consider themselves part of society. It was believed that those who violate the law are a police officer’s main clients. But, looked at from a different perspective, police officers are members of society, they live with the people around them and their children go to the same schools. Their clients shouldn’t be criminals. Instead, the clients of the police should be people who want to live in peace, who pay taxes to pay police officers’ salaries. This is something police officers must understand. Both new and re-attested police officers must understand that they work for the benefit of the people they have taken their oath to – their families, and their country. Once a switch to such a mentality takes place, all those who passed re-attestation – no matter whether this re-attestation went smoothly or not – must draw a line beyond which a different day and different way of working begins for them. You can say that police officers should make EUR 2,000-5,000 a month. The truth is, without an organisational culture and values, money won’t help, as after six months even that will not be enough. — Many foreigners, who came to help reform Ukraine, often complain about resistance from those who represent the old system. Have you encountered something similar? — Yes and no. Reforms depend on both those who want to reform and those who come to assist with reforms. Those who want to reform must demonstrate genuine interest in reforms, not on paper only. At the same time, those who come to assist with reforms must understand the reality they find themselves in. They must assess the situation and try to share their experience in a way that is most suitable for the country and the environment. Finding synergy is crucial. I can share a great example from Lithuania. In 1991-1992, someone decided that Norway’s pension law is perfect for us. The law was translated word by word, from Norwegian, and Parliament adopted it. Strangely, it did not work. We wondered why it failed, and the reason is simple: the problem was that the Norwegian mentality had not been brought to Lithuania with the law. — Is the Border Guard Service also within EUAM’s mandate? — Not exactly, but yes, it is. The State Border Guard Service has worked closely with EU bodies on different projects since 2013, and the EU supports the border guards financially. The Border Guard Service has been developing, rather successfully, for several years now. At the moment, we are helping them to establish effective HR management systems within the organisation. — Lithuania went through many of the changes that Ukraine is undergoing now back in the 1990’s. What must be taken into account, in the first place, given your country’s experience? — I don’t think there is one correct answer, as the political situation then was different from what you have here, now. You must definitely establish stable, functioning law-enforcement bodies as soon as possible, develop training and retraining programmes, introduce new management techniques, i.e. strategic planning, effective resource management, priorities, modern ways to assess activities. I recently heard an example in the Ukrainian parliament of quantitative methods to assess activities. Quantitative methods have not worked for a very long time now! Simply saying that the level of crime has increased by a certain percentage, while the level of solved cases has increased by that many percent… I can share at least three ways to improve these statistics, on paper. Or, for example, we tell a police officer to bring in 10 violation protocols after a day on duty. Let me tell you what is going to happen: the police officer will find an intersection and will have these 10 protocols ready within an hour. But will it improve road safety? No way. That is why modern assessment techniques must be introduced as soon as possible. As to reforms, one must realise that reforms are an ongoing process. I worked in the police for over 20 years and we went through at least six reforms and are now they are going through another one. Everything changes very quickly. — That was Ukraine’s political situation. Now, however, there is a critical mass of people who refuse to live the way things used to be; they demand reforms, which are now taking place. It is all up to people. Speaking of police, prosecutors etc., there must be critical mass of reform-minded people there. Only then, changes are possible. New powerful leaders, ready to lead changes, must emerge. This is not easy. Sitting doing nothing, for 20 years, never leaving one’s comfort zone, doing same thing every day for 20 years, it is very difficult to change your habits overnight and do everything differently. But that is life; we must change. — Could you please tell us more about the new anti-corruption project that is expected to be launched soon by the EU and Denmark? — This project has been jointly developed by the EU Delegation in Ukraine and the European Commission Support Group for Ukraine, as well as EUAM experts. Three directions are planned and significant funds will be allocated for the project. These are 1) assisting the newly established anti-corruption agencies to become independent and stable functioning organisations; 2) financial resources to support NGOs and journalists; and 3) assisting the Parliament to adopt effective anti-corruption legislation. Additional funds will be allocated for the prevention of corruption, for anti-corruption awareness campaigns to explain why corruption is a bad thing and why it is important to start with oneself, i.e. stop giving and taking bribes. — Electronic declarations are a positive solution. Without them, it is impossible to fight corruption, especially given the level of corruption in Ukraine. Yes, the system may not be perfect, but, as any living being, it constantly improves. It has been launched, so now you only need to perfect it. Ukraine should not stop it; instead, it must be used more extensively, and everything will be fine. As public servant, I have been declaring my income since 1996. Declarations were first submitted on paper, in Lithuania, but now everything is submitted electronically, for 10 years now. The system has been significantly improved. Now, it takes me 15-20 minutes once a year to submit my declaration via the bank where I receive my salary. No problem whatsoever. Searching by my first and last name, you can find information on my income, how it dropped, or increased, and which assets I possess. I don’t have any problem with that. — What kind of liability is there in Lithuania for those officials, who submit declarations late or lie? — Liability is defined by the special Commission for Professional Ethics. If there are only minor mistakes in the declaration without serious violations of the law, a person may submit a secondary, or additional, declaration. Should a discrepancy between the declared assets and income be established, the tax inspection and other law-enforcement agencies, depending on the seriousness of the violation, will take a decision on liability, up to and including possible criminal liability. It can also be deemed a violation of the tax code. — It requires time. I don’t know whether five, ten or fifteen years are necessary. This will depend on how quickly people will get used to it. On the other hand, you should not stop, even if something has not worked well the first time. Keep improving; then everyone will get used to it and it will become part of your life. It has become a normal exercise for me, a regular obligation as a public servant. — You mentioned that, because of different mentalities, the same rules do not necessarily work in different countries. Which are the peculiarities that prevent certain reforms from progressing in Ukraine? — I don’t think it is due to a different mentality. But there is one thing that you must do. Once you believed in the Revolution of Dignity, you must believe that you are able to build your own state. Young people that I communicate with are very energetic and they want changes. People at my age have many doubts. I urge you not to give up and move forward, and not be afraid to make mistakes and correct them. There is no magic wand that would help anyone in power change everything with one wave. This can only be achieved through daily painstaking work. And the leaders of the country must help their people and work together. There is no one universal recipe.